You can expect to catch anything from jumbo perch, largemouth and smallmouth bass, walleye and northern pike to the ever-exciting Muskie. Lake Nipissing and The Upper French River is famous for its fishing. 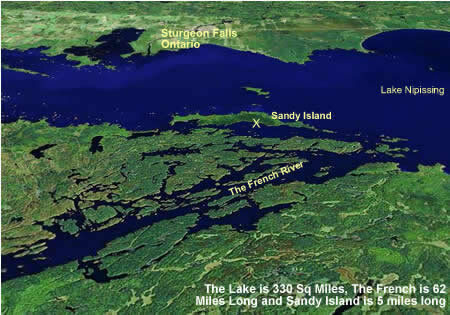 It is fairly remote area and only accessible by boat or plane. There are countless weather protected areas for you to fish. Most of our guests are successful fishing on the river within a 0-4 mile radius of Sandy Haven Camp Fishing Lodge. Get your fishing licence before you leave home! Licence’s are available online or by phone. You will need to decide whether you want a “Sport” or “Conservation” Licence.Below lists how many fish you may have in your possession with either choice. How much does a fishing licence and “Outdoors Card” cost? These are your possession limits.The amount of each species that you may have in your possession at any one time. The S stands for a “Sport” licence holder. The C is for a “Conservation” licence holder. Walleye Open 3rd Sat. in May – Oct. 15. S – 6 Large Mouth Bass and Small mouth Bass or any combination. C – 2 Large Mouth Bass and Small mouth Bass or any combination. Yellow Perch Open 3rd Sat. in May – Oct. 15. Lake sturgeon closed all year. Yellow perch have an elongated body, with a green to olive or golden-brown back; sides are yellow to yellow-green, with dark vertical stripes (usually 7). Their lower fins are usually red to orange. Age and growth varies widely between perch populations. For example, perch may reach 10” (25 cm) by age four in Lake Erie; however, in many small inland lakes, perch may never exceed6” (15 cm). Perch can live to be over 11 years of age. Yellow perch are one of Ontario’s most sought after fish, both by anglers and commercial fishermen. Yellow perch are one of the finest tasting freshwater fish. Perch tend to form large schools, making them easy to catch. Popular baits include small minnows, worms and grubs, as well as small jigs and spinners. They can be caught in a variety of habitats year-round. Perch are readily caught through the ice throughout the entire winter as well. Recently, catch and possession limits have been imposed on a number of water bodies; check your regulations for details. The largemouth bass is the largest member of the Sunfish family. The body shape is only slightly longer than deep, and thicker than the other Sunfish. Largemouth’s tend to get deeper than smallmouth’s. The body is usually a green color with a wide dark horizontal stripe extending the length of the body. To distinguish a largemouth from a smallmouth look at the mouth; a largemouth’s jaw extends past the eye. Like the smallmouth, the largemouth bass is a much sought after sport fish more often sought after for its fight than for its fillets. Most of the fish are caught during the summer months with July being most productive.When fish are in an aggressive mood, fishing with fast moving baits or top water baits offers the most excitement. During tough fishing periods switching to more subtle techniques can produce a couple of fish on an otherwise fishless day. Using plastic worms and fishing slowly through dense cover can be a very effective method. Live bait fished with a bobber is also another tactic that should not be overlooked. The growth of largemouth bass greatly varies within their range. The rate of growth is significantly higher in the more southern regions. In Ontario it typically takes 4-6 years to reach 30 cm (12”). The maximum age seems to be between 13-15 years, reaching lengths of 55 cm (22 inches) and reaching weights of around 5 lbs. Any largemouth over five pounds should be considered a trophy. The smallmouth bass is one of the largest in the Sunfish family (second only to the largemouth bass). The body shape is only slightly longer than deep and slightly thicker than the other Sunfish. They vary in color depending on water clarity but are usually golden brown to olive green with 8-15 vertical bars on the sides. Smallmouth’s may be confused with largemouth bass but offer the following distinctive differences: smallmouth’s have vertical bars on the sides, dark bars radiating from the eyes and the mouth reaches only as far back as the middle of the eye. Growth rates vary across the distribution depending on a variety of factors. Warmer waters tend to produce faster growing fish but small waters with large populations tend to be stunted. Maximum age in Ontario is suspected to be 15 – 18 years. It takes usually about 6 years for a bass to reach 30 cm (12”). Typical Ontario smallmouth’s are under three pounds and usually between 20-40 cm (8-15”), however, many trophy fish between 5 – 7 pounds are caught annually. It is commonly argued that smallmouth’s are pound for pound the hardest fighting sport fish. In their arsenal are spectacular jumps that usually have the entire fish out of the water. The most exciting time to fish for smallmouth’s is in the early summer after spawning when they are still shallow. At this time they will hit almost anything with hooks. Fishing during calm evenings with top-water lures is some of the most exciting fishing available. Later in the year, smallmouth’s move to deeper rocky structures. Using deep diving crankbaits that imitate crayfish or an abundant fish species can be very effective at this time. Tube jigs are another popular bait for bass as are other crayfish imitating plastic baits. The most popular live baits are crayfish and leeches. During the late fall, fishing is tougher, but can produce the biggest fish of the year. Walleye have an elongated body shape. They have large teeth, and are characterized by their “glassy” opaque eyes. The sides of walleye are olive green to gold, with black patterns. The bottom tip of the tail is white. Walleye can live to be quite old, up to 25 years or more! As with many species, their growth rates vary with their environment and fishcommunity.For example, in the Bay of Quinte, a 4- year-old walleye may be 18” (46.5 cm) and 2.75 lbs., whereas in the Kawarthas, an 18” walleye may be 6 or 7 years old. Walleye are one of Ontario’s most sought after fish, both by anglers and commercial fishermen. They are extremely tasty, and are good fighters. As previously mentioned, they are most aggressive in low light conditions. Popular baits include worms, minnows and leeches. Many people troll or cast with plugs or crank baits along weed lines for walleye. Jigging in the weeds can be a very effective way of catching walleye during the day. Rocky points and shoals can attract walleye throughout the summer months and they can be caught using jigs or spinners tipped with live bait, or by using deep running crank baits. As the water temperature cools in the fall walleye will school in deep water usually off of rocky points. Pike have a very elongated body, with a very long head. They have large eyes near the top of their head. Pike have very large teeth, which hook backward into their mouth, which helps keep prey from escaping. They generally have five pores under each side of their lower jaw. 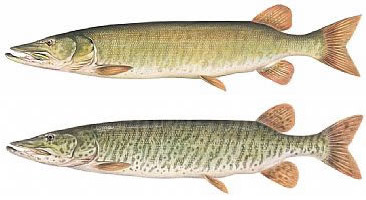 Pike are dark green to olive green, with white mainly oval spots. The dorsal fin on the pike is set well back on the body. Pike and muskellunge are similar and often inhabit the same bodies of water, so make certain that you can spot the differences in the two because regulations and seasons are often quite different. Pike can be relatively long lived, up to 24 years. In most populations, the females grow faster and generally live longer. Pike can be readily captured in both open water and through the ice. They are strong fighters and make an excellent meal. Some of the best fishing for pike is immediately following ice out. They can be caught by casting or trolling big spoons or plugs, and can also be captured by fishing large spinner baits along weed lines in shallow bays. Using very large minnows in deeper water can be effective in the summer. When filleting a pike take caution to remove the “Y” bone. Many wild game and fish cookbooks feature details of this process.